OVERLAND, Mo. 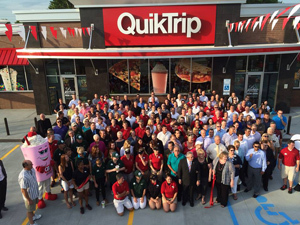 --QuikTrip Corp. opened its 700th convenience store on Thursday in Overland, Mo., near St. Louis. The chain has opened 100 stores in the last two years, according to a report by The Tulsa World. "The new growth is absolutely phenomenal in its own right; however, when you include the relocation of existing stores, rebuilds on existing locations and the remodeling for our full-service fresh food offer, QuikTrip employees have performed absolutely Herculean feats," said Chet Cadieux, president and CEO of QuikTrip, in a statement obtained by the newspaper. "I continue to be humbled by the dedication and flawless execution of our long-term strategy by QuikTrip employees; yet the biggest source of pride for me personally is the hiring of 5,000 new employees during that same time frame," he said. Last week, QuikTrip also opened a new convenience store in Charlotte, N.C., its 50th within its Carolinas Division. The c-store chain opened its first Carolina store in Boiling Springs, S.C., in Oct. 2011. "We accomplished this in less than three years, which is the fastest new-store growth for a new division in QuikTrip's history," Cadieux said. Spokesperson Mike Thornbrugh told the paper that while QuikTrip will continue building stores, it won't be at the same pace as in the last couple of years. The company is focusing on the just-announced official rollout and retrofitting of its QT Kitchens fresh, made-to-order menu of food, premium drinks and frozen treats in all of its stores by the end of 2014. Events at the new St. Louis-area included a local radio remotes, St. Louis Cardinals promotional team with Fredbird, St. Louis Rams cheerleaders, Budweiser Clydesdales and "Show Me Sound Organization" Drumline. It offered prizes and free Big Q fountain drinks at all St. Louis-area stores. Tulsa, Okla.-based QuikTrip operates its convenience stores in 11 states: Arizona, Georgia, Illinois, Iowa, Kansas, Missouri, Nebraska, North Carolina, Oklahoma, South Carolina and Texas. Click here to read the full Tulsa World report.